In 2008, the BBC reported that the UK was facing a shortage of dentists. More than 1 in 6 people were struggling at the time to find an NHS dentist, and many were just giving up. This is changing, but a large number of dentists still prefer to offer private dental services over public services. An increasing public interest in cosmetic dentistry – tooth whitening, polishing, and computerised smile analyses – has seen the average salary of private dentists grow significantly. There will always be a demand for cosmetic services, and there will always be a growing demand for public dental health workers. Despite this, many are unsure what route to take in pursuit of a career in dentistry. There are a number of different career pathways and each has its own merits. Some have a greater potential for funding, whereas others are more vocational but allow for part-time study. As medically trained professionals, dentists are trained with the same rigour as doctors; therefore, good grades and an ability to retain lots of information are a prerequisite for any aspiring doctor (dentists are qualified doctors but do not always use the prefix). There are also a number of different pathways to consider following university. Dental healthcare is constantly evolving and dentists are required to stay up-to-date with the latest technology and dental techniques. Whatever your aim, this detailed guide will provide you with all of the information you require to pursue a career in dentistry. There are a number of different types of dentists working for the NHS. Each type of dentist is not necessarily a specialist, but the way they work, where they work, and the salaries do vary. Here are a few details of the different types of dentists working in the NHS. The majority of dental students will go on to work as general dental practitioners (GDP’s). GDP’s usually work in high street dental practices, offering general dentistry to the public through the NHS. Although most dentists work under the auspices of the NHS, many offer private services as well. Offering both public and private services allows dentists to offer a wider variety of services, increasing the earning potential and customer base of the practice. While NHS prices are pre-set, dentists can charge whatever they like for private services and they vary throughout the country. People with special needs who require dental surgery can usually be treated in their local practice. However, this is not always the case and that is why community dental care is provided on the NHS. Community dental care encompasses a variety of different methods of delivery, including: home visits, temporary dental in nursing homes, and mobile clinics. If a patient requires a more specialist service, they will need to be referred by their regular dentist. Community dental professionals are required to travel as a normal part of their day. Working both full-time and part-time, they could spend one day in a school as a visiting health nurse, or the next day in a van providing treatments for children with tooth decay. Most community dentists will work within a larger team who offer a range of complimentary services. Hospital dental care professionals are usually specialists in their field. They provide emergency dental care for patients with more urgent needs. Generally, hospitals do not provide dental treatment, but patients can sometimes require urgent dental surgery as part of their wider treatment plan. An exception to this rule for this type of dentist is hospitals, which require large numbers of patients for educational purposes. Dental hospitals offer reduced fees to entice patients and a wide variety of services. Both general medical doctors and dentists can refer patients to hospital dental specialists. Diseases, urgent restorative surgery, and trauma will sometimes result in a referral to either a hospital or specialised clinic. All hospital dental specialists hold postgraduate qualifications and will have followed a very similar career path. There are 5 sub-specialties in the hospital dentistry service: oral and maxillofacial surgery, oral surgery, orthodontics, paediatric dentistry, and restorative dentistry. Whereas hospital dentistry is a high specialised role, dental public health careers are almost entirely non-clinical and involve making dental assessments. Dental Public Health is mainly concerned with improving the quality of dental care for the general population and increasing awareness of dental issues. There are few academic roles within this growing department of dentistry, but there are a few advisory academic posts available within the NHS and Department of Health. Even though qualified dentists will be trained to provide a certain level of cosmetic dental services, there are separate dental qualifications available for those who want to specialise just in certain types of cosmetic dentistry. Dental Care Practitioners are clinical healthcare professionals who are not fully qualified dentists. They provide a range of services to assist in providing quality care. 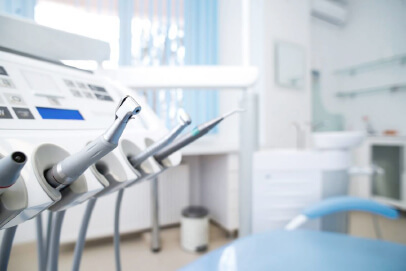 Dental nurses, for example, provide assistance in all manners to the dentist, including: sterilizing equipment, mixing treatments, administration, and disinfecting the work area. Nurses are often required to undertake an eclectic array of roles to ensure the smooth running of the practice. Dental hygienists focus on preventative care. They are responsible for preventing tooth decay and other oral problems. Polishing, scaling, and applying topical fluoride are all treatments offered by dental hygienists. Dental Therapists are similar to dental hygienists, except they are qualified to undertake a wider range of procedures. Once the dentist has made an assessment of a patient’s oral health, he/she will request certain procedures to be performed by the dental therapist. This could just be a polish and scale or it could be an extraction under anesthesia. Dental Technicians are employed to create crowns, dentures, and braces to improve the appearance of teeth. Depending on where they are employed, dental technicians roles can be highly specialised. In particular, hospital dental technicians often work with cosmetic surgeons to reconstruct patient’s faces following trauma or disease. Dental healthcare practitioners typically require less training than a dentist; however, that does not mean that the potential for career progression is limited. There are a number of training opportunities available to dental care practitioners that allow them to take on more responsibilities and increase their salary. All dental professionals require training under the auspices of the General Dental Council (GDC). In 2008, it became mandatory for all dental professionals, including dental nurses, technicians, and hygienists, to become registered members. All courses available in the UK are registered with the GDC and students are required to register with the organization before practicing dentistry. Despite the myriad of legislations and regulation of the health industry, training in dental healthcare is relatively short compared to some other healthcare roles. While dentists, like doctors, should expect to train for about 7 years before being able to work independently, dental healthcare practitioners can qualify in about 2 years. All of this depends on the academic pathway, and some more specialised roles require additional training. All prospective dentists will need to pursue an undergraduate dental degree and most students will follow a similar route to postgraduate study. Students of dentistry are required to work towards a Bachelor of Dental Surgery (BDS or BChD) and are required to complete 5 years of undergraduate training. This is the industry standard dental course and it includes both theoretical and practical training. While academic requirements are usually very high, they can vary between schools. Universities almost always require 3 A’s at A-level, and these must include biology and chemistry. There is a shorter course for students who have completed an undergraduate degree in a different field. This includes both theoretical and practical training and is for graduates with a 2:1 or higher. This pathway will see you graduate in 4 years; however, dentistry is an evolving field and graduates will be expected to complete postgraduate or practical training before treating patients independently. As with A-levels, the prior degree must have had a significant element of biology or chemistry, although biomedical science graduates are also usually considered. For students who did not study science at A-level or did not make the high grades required for direct undergraduate entry, there are universities that offer pre-dental access courses that precede a 5 year dental degree. These courses are designed to bring students up to speed on A-level chemistry and biology and prepare them for further study. The entry requirements are still be rather high – the University of Manchester still expects AAA at A-level – but these can be in humanities subjects. Most universities will not consider general studies as an A-level. Many universities do not even consider GCSE’s in their entry assessments; however, as the number of students attending university increases, the deeper the admissions boards are looking for academic merit. Many dental schools will only accept candidates now with adequate GCSE results. Grade A’s in the sciences and at least a B in English is a typical requirement for dental training. However, do not be disheartened if you did not make these grades. There are a number of dental schools throughout the UK, and they all promote different entry requirements. And students who did poorly at GCSE have the opportunity to retake their GCSE exams, albeit with a small cost involved. The most competitive dental schools, especially those in London, are more likely to be more stringent in their entry requirements. In fact, in London there are over 100 applicants for each single place on some dental courses, so it is worth applying to multiple schools in order to avoid disappointment. The NHS now recruits from outside the UK to fill essential gaps in their employment. Many international students will attend university on the basis of qualifications other than A-levels. This includes the International Baccalaureate, a qualification also open to students within the UK. Entry requirements will typically stipulate that 36 points are required, with 666 in the higher level subjects and 555 in the lower level. This must include 1 science subject. Other international entry requirements for the most popular dental courses can be seen on specific course pages on university websites. All newly qualified dentists will be required to undertake a certain amount of postgraduate training. This can be academic training, in the case of dentists who wish to go on to specialise in certain areas of treatment, or Continuing Professional Development. Training following an undergraduate degree often takes the form of specialist training and vocational training. All undergraduate dentists will be required to take Dental Foundation Training, which includes a significant portion of time spent in primary dental practices offering general dental services. Students should complete this training within three years of their undergraduate degree. Dental foundation 1 usually takes place over 1 year. There is a second stage that of foundation training that equips students with a specialism. Students who wish to specialise in a certain area of dentistry, such as restorative care in a hospital, will be required to complete postgraduate qualifications. All emergency dental surgeons and some specialists will also be required to obtain a Membership of the Faculty of Dental Surgery (MDS) or a membership of the Royal Surgical College. Training will be demanding and take place within a hospital setting. It will be combined with further study and students will complete the training with a postgraduate qualification. The General Medical Council makes continuing training mandatory for all dentists on its register. Short courses, available both vocationally and online, are available to dentists to further their knowledge and stay up-to-date with the latest advancements in dentistry. CPD can also be taken through a postgraduate degree route on a part-time basis; however, dentists will only have their license renewed if over 250 hours of CPD has been completed every 5 years. 75 hours must be from verifiable CPD, which includes vocational training. Unverifiable training accounts for the dentists own training taken on e-learning platforms etc., and dentists are required to submit records of the training they have completed. The British Armed Forces offer a certain degree of CPD training within both the regular and reserve forces. The armed forces provide CPD training to dentists through the British Dental Association Armed Forces Group. There is also a British Army Dental Corps, which is constantly recruiting specialists and general dental professionals into its ranks. Dental practices cannot operate without qualified healthcare professionals. Dental nurses, technicians, and hygienists acquire a certain amount of responsibility for treating conditions. This reduces the pressure on the main dentist and ensures an efficient working environment. Entry into dental careers need not be dependent on high grades and experience. They do, however, still expect a certain degree of essential skills, such as confidence working under pressure and communicative skills. Dental Hygienists are required to have undertaken a course authorized by the General Dental Council, which is mandatory for all dental professionals. Dental hygienist courses usually take around 2 years of full time study and vocational training. Entry requirements, as opposed to dental training, is lenient and simply requires five GCSE’s grade A-C and 2 A-levels or a recognized dental qualification. Dental Nurses are not required to have any specific academic qualifications, although most dental nurse courses require GCSE’s at grade A-C and a few require A-levels. Some prospective nurses decide to take the vocational route and train within a practice whilst studying part-time. Nurses who opt for the vocational route work towards a level 3 certificate, such as an NVQ Level 3 in Dental Nursing. There are full-time courses in dental nursing offered by some universities. These typically have more stringent entry requirements than apprenticeships or traineeships. Some students on full-time courses still complete a period of vocational training as a part of their course. Dental nursing experience can also lead onto Dental Therapy training. All dental therapists are required to have some dental nursing experience before training, so this career path offers a significant amount of potential for progression. Dental Technicians all need to take recognised qualifications, such as the B-Tec National Diploma in Dental Technology, a foundation degree in dentistry, or the BSc Hons in Dental Technology. Other options include part-time training as a dental trainee. Trainees will take the academic qualification on the side of their work on a part-time basis. While the BSc Hons requires A-level entry at grade A-C, the B-Tec route requires students to have obtained GCSE’s at grade A-C. The Complete University Guide publishes a list of the best universities for dental studies in the UK annually. This guide, is a useful resource for potential students. All dentistry courses are recognised by the GDC and will feature a similar syllabus, but university ranks are useful for determining the teaching quality and other criteria at institutions. Dental schools are university-affiliated teaching institutions that focus solely on dentistry. There are 16 in the UK, 11 of them based in England. There are institutions in every major region of the UK, and many of them conduct world leading research. There are generous finance options open to students, including grants, bursaries, and loans. The NHS provides finance to students on 5 year degree programs, which is usually paid following the successful completion of year 5. Finance will usually cover tuition fees and a certain degree of maintenance costs. Non-means tested grants of up to £1000 are also available to students who complete the 5 year programs. Graduate entry students are also entitled to a certain amount of funding, but are largely exempt from the tuition fee loans and grants provided by the NHS. There is a possibility of acquiring funding through the Student Loans Company, but this depends on previous study loans and income. Graduate entry students are entitled to the same funding following the first 4 years of their course. Those on graduate accelerated courses are liable for £3,465 of their first year tuition fees, but are entitled to NHS Bursary Scheme funding thereafter. To find out if you are entitled to funding, the NHS offers this resource for prospective students to calculate their entitlement. The NHS recognizes that dental healthcare practitioners play a pivotal role in the UK’s dental healthcare system. They have therefore provided means-tested funding for trainees since 2012. This could be anything up to £4,395 and a £1000 grant. Students in London will be entitled to more to cover the extra costs of living in the capital. All of this funding information is correct as of 2015; however, the government aims to change student funding in 2016/17 and the NHS and Student Finance England are unsure what the changes will mean for dental students. Prospective dentists on the Dental Foundation Training year are paid £30,132 per year. Depending on the route taken following the foundation year, trainees should expect to earn between £29,000 and £40,000 per year. Some trainees will decide to work directly in a dental practice, whereas others will decide to undertake Dental Core Training. Are Dentists Paid a Salary? While the earning potential for dentists is very high, most community dental service dentists are paid a set salary. Obviously, they can supplement their income with other means, but salaries vary between £38,095 and £81,480. Things like commitment, experience, and services offered all affect dentist salary in the UK. The highest paid dentists will offer a combination of NHS and private services. This way, they can pick and choose what services they want to offer, the most cost-effective way to offer them, and take control of their work life. NHS salaries can be anything up to £110,000 a year. Consultants and Specialists working in hospitals make a considerable amount more than trainee dentists. Starting salaries for consultant specialists are around £75,000 per year, rising to £100,000. Of course, this all is relative to the experience of the consultant and their specialism. Those who specialise in more than one area will inevitably have the potential to earn more. The NHS dental website contains a host of information for prospective students and those interested in finding more out about dental careers. Information of specific careers in dental healthcare is also available from the National Careers Service. This fantastic website offers a host of information regarding work patterns, work activities, and working conditions. We also have a list of dental jobs on our site, so you can get a feel for the kind of roles available around the country. All dental students will be required to register with the GDC, so it is vitally important that you check out the information provided on their website. From here, you can register, update your details, and find information on training and standards. Particularly of interest to prospective students is this resource, which offers details of educational standards and can really help in choosing a respected dental school at which to study. A dream of many dental students, opening a private practice is seen as the pinnacle of any dentist’s career. Whatever the incentive, the opportunities are endless. While opening a private practice may seem like the ultimate dream, there are many costs involved and certain skills required of the dentist. As an owner, employer, and employee, the dentist will often have to commit to roles other than dentistry, such as accounting and administration. There are also legal considerations and certain risks involved. Dental care professionals working for the NHS are paid all subject to a pay scale. More qualified professionals are paid in a different band to newly qualified professionals. The potential for progression lies largely with the professional, and it is dependent on their willingness to progress. Further training will lead to more responsibility and allow for progression up the pay scale. The salaries vary per band and can increase quite dramatically. For example, band 1 employees, such as clinical support workers, are paid between £15,100 and £15,300 per year. However, band 2 professionals can earn up to £17,800. Each band is also split into points, which allows for a large degree of progression within the pay scale. The highest paid dental health practitioners, dental laboratory managers, are paid up to £67,805. Details on the actual pay rates and the scale can be found here. As with dentists, health professionals working in a private practice are still able to earn a supplementary income depending on their level of responsibility. This will be largely dependent on the dental practice and services offered.